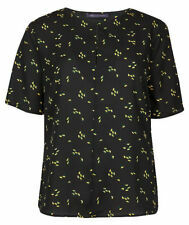 Ladies Per Una M&S Black Top Size 14. Condition is Used but excellent condition. Dispatched with Royal Mail 2nd Class. Ladies top. Length -25. (Jewellery not included). BRAND NEW AND UNUSED Women's plant more trees save the bees t-shirt. Size 10. Delivery UK only. Top to bottom middle back is approx 26”. Great used condition still looks fabulous with plenty of wear left. A very generous Size 28. Polyester elastane, but I'd describe the fabric as a snuggly very fine knit, better quality than a T-shirt. Label says bright mauve, but I'd say it's more of a lilac. It's very rare to find an M&S item in this size. Bright floral, cool and lightweight. Very good condition. 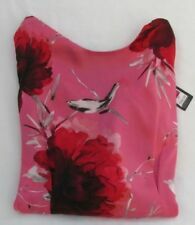 Marks and Spencer size 18 top excellent condition. Fabulous summery colours! This top is so versatile and has a cream camisole top for underneath. Ne ve r worn on ly t ri ed on a nd p ri ce t ag s removed. N ot a s he av y/ thicka s a regularsweatshirt wi th l on g sleeves,t ur n up c uf fs an d a pr et ty flora l graphic. T he material is 9 7% polyester 3 % elastane. Lovely Emerald Green Top By M&S size 20. This gorgeous top has never been worn just hanging in the wardrobe. It’s soft and light with a frill for a collar. The long sleeves have elastic and a frill at the bottom. It fasteners at the back with 2 small buttons. The length is 26” Check out my other items, I am having a clear out. Ivory background with navy yellow pale blue & orange pattern. White Multi Butterfly Print. material: polyester. length from top of shoulder to hemline: 25". armpit to armpit: 19". 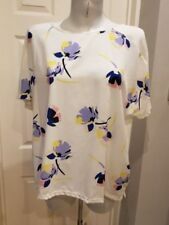 Marks and Spencer Indigo Collection ladies peasant style blouse size 16. New without tags. Slate blue with orange floral pattern. Lovely 3/4 sleeves. This is a sheer blouse with an attached cami underneath. Relaxed fit. An ideal festival boho blouse. Any questions please ask I am more than happy to help. We are having a family clear out so have a look at my other listings, I am happy to combine postage. Proof of postage always obtained. Pet and smoke free home. New and unworn but tag removed to try on. Neck and cuff edges are bound with faux leather. Little bells on the end of neck tie. Questions welcome. Measures 18" from armpit to armpit. 15" from armpit to side hem. Please check as I cannot exchange & do not refund for items that don't fit. Questions welcome Proof of posting always retained. From non-smoking home but we do have cats. Really nice t- shirt from Marks & Spencer’s. Colour – Pink Mix. Short Sleeve, Round Neck. nd class signed for. Ladies contrast striped print relaxed fit casual top, Marks and Spencer size 12. Relaxed fit. Back length 23". Pit to pit 23". Front seam detail. Here we have a lovely Relaxed Crew Neck T-Shirtfrom Marks & Spencer’s. 65% polyester, 35% viscose. 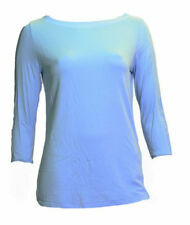 Here we have a lovely Round Neck Long Sleeve Blouse from Marks and Spencer. Lace detailing to neckline and sleeves. Colour – Cream. Round neck. Long sleeved. 99% polyester. 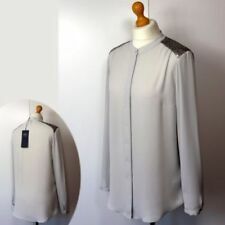 New listingLadies M&S Limited Edition Long Blouse Lilac Size 6 with Labels! 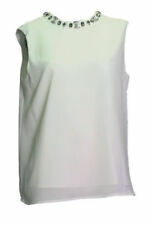 Ladies Size 18 Sleeveless white and blue Flowery Summer Top. Crossover detail on the back. Perfect for summer. Condition is Used. Dispatched with Royal Mail 2nd Class. Crinkle material which stretches. across the front from pit to pit:21-24". side length from pit to hem:15 1/2". colours may slightly differ due to screen resolutions. long sleeved top. back length from neck to hem:23". BY MARKS AND SPENCER. LADIES STRIPED TUNIC TOP. STRETCHY MATERIAL. FROM SHOULDER TO HEM 28". FROM ARMPIT TO ARMPIT 24". SORRY NO BUY NOW. Marks and Spencer’s limited range top. Hangs down lower to left hand side at front. Very elegant too. Great with white skinny jeans !